The heart is a muscular organ found in all animals with a circulatory system. The heart is responsible for pumping the blood through the blood vessels. The function of the heart is to collect de-oxygenated blood and pump it into the lungs, so that carbon dioxide can be dropped off and oxygen can be picked up. Oxygenated blood is pumped out to the smaller arterioles and then, finally, to the tiny capillaries which feed each cell. In an average lifetime, the heart beats more than two and a half billion times, without ever pausing to rest. The human heart weighs between 250 and 350 grams and is about the size of a fist. The heart is positioned anterior to the vertebral column and posterior to the sternum. A double-walled sac called the pericardium, which prevents overfilling the heart with the blood, protects the heart. The outer wall of the human heart is composed of three layers: epicardium, myocardium and endocardium. 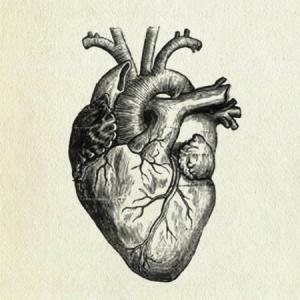 The human heart has four chambers, two superior atria and two inferior ventricles. Two atria chambers that receive the blood are the right vertical which discharges the blood into the lungs, while the left one discharges the blood towards the rest of the body via the aorta. The human heart has four valves, which determine the pathway of the blood flow through the heart. A heart valve allows the blood to flow through in only one direction, and it opens or closes depending on the different pressures on each side of it. The tricuspid valve is on the right dorsal side of the heart, between the right atrium and the right ventricle. The mitral valve lies between the left atrium and the left ventricle. The aortic valve lies between the left ventricle and the aorta. The pulmonary valve lies between the right ventricle and the pulmonary artery and has three cusps. Blood vessels transport the blood throughout the body. They are divided into the arteries which carry the blood away from the heart: the capillaries which enable the exchange of water and chemicals between the blood and the tissues; and the veins which carry blood from the capillaries back to the heart. The pulmonary artery is the only artery that carries deoxygenated blood. In humans, The pulmonary artery is about 5cm in length and 3 cm in diameter. It branches into two pulmonary arteries, which deliver de-oxygenated blood to the corresponding lung. The aorta is the largest artery in the body, which starts from the left ventricle of the heart and extends down to the abdomen. Aorta branches into two smaller arteries and distributes oxygenated blood to all parts of the body through the systemic circulation. Veins are blood vessels that carry blood towards the heart. Most of the veins carry deoxygenated blood from the tissues back to the heart. Only the pulmonary and umbilical veins carry oxygenated blood. The pulmonary vein is a large blood vessel that carries blood from the lungs to the left atrium of the heart. There are four pulmonary veins, two from each lung. Vena Cavae are two veins: the superior and inferior vena cava. Their function is to return deoxygenated blood from the body into the heart. can u avdvice me pls...! Should I switch to the Rythmol?